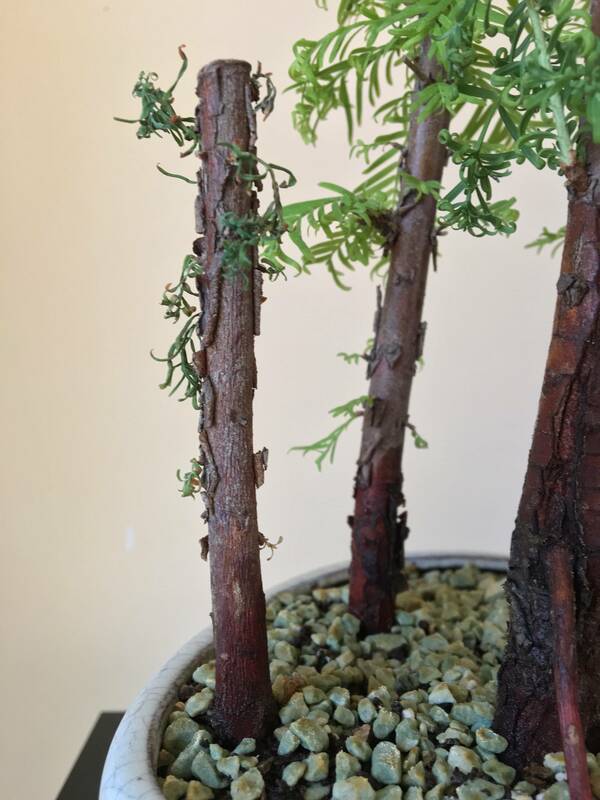 I have a Dawn Redwood Bonsai Forrest. 3 out of 4 mini trees are doing fine (2 are doing great, one is doing fine) but the forth (the smallest one) looks sort of bad. Its leaves are look sort of dry and I don't know what I can do about it. When I received it, maybe 2 weeks ago, I had to repot it because one of the trees were nearly out of the soil and the soil was beyond horrible. So, I repotted it and the tallest tree that seemed like it was about to die started growing and seems much better. On the other side, the smallest tree seems sort of sick? I try to expose them as much sun as possible because I do know they like full sunlight and the soil is easily drained, yet moist. Is there something else I could possible do? (I've attached some photos just to see the condition of the trees right now). It is a beautiful species for a bonsai forest, do you keep it indoor or outdoors? The small tree unfortunately seems dead, if you ask me. You can of course keep it for a while to see if there are new shoots next spring. The leafs on the larger tree at the right of the picture also seems to become a bit darker and curlier. Be careful not to lose that one too. The problem can be that it was not well placed in the soil for a while, like you said. But it can also be because of humidity. That is often the problem for indoor bonsai. If the problem was the soil, you can try to give it a vitamin boost, but I think the new soil you gave during repotting will be sufficient for recovery. Of course if that was the problem. So see if it will recover, if not try to make some clones next spring of the still living trees when you trim them. By the way, a forest with an odd (uneven) number of trees seems more natural than one with an even number. Not the answer you're looking for? Browse other questions tagged trees bonsai or ask your own question. Are my autumn blaze maple trees dying? What's causing the bark on my maple sapling to split?